Morton’s Neuroma - Morton's neuroma (also known as Morton's metatarsalgia, Morton's neuralgia, plantar neuroma and intermetatarsal neuroma) is a benign neuroma of the interdigital plantar nerve. This problem is characterized by numbness and pain, relieved by removing footwear. Although it is labeled a "neuroma", many sources do not consider it a true tumor, but rather a thickening of existing tissue. Morton's Foot is one that suffers from Morton's Neuroma: Morton's neuroma: A swollen inflamed nerve in the ball of the foot, usually between the base of the second and third toes (known as the third intermetatarsal space), caused by chronic compression of a branch of the plantar nerve between the ends of the metatarsal bones. The disorder is especially common in women who wear high-heeled and/or narrow shoes. Dr. Michael Horowitz offers a 5-step process to successfully treating Morton's Neuroma. He can help evaluate & diagnose your symtoms and recommend the best course of action. 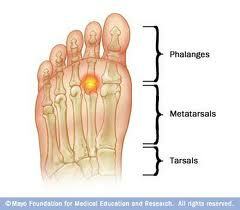 Call Vancouver Orthotics at 604-737-3668 to treat Morton's Neuroma. What is the most effective Morton's neuroma treatment? What exercises & stretches do you recommend for patients with Morton's neuroma? What symptoms are most commonly associated with Morton's neuroma? What exactly is is the interdigital plantar nerve & what shoes are best for Morton's neuroma? Where can I get medical hardware for Morton's neuroma? Why is my Morton's neuroma pain so acute?